George H.W. Bush, the nation’s 41st president, leaves a remarkable legacy and lifetime of achievements. Bush, who died Friday evening at his Houston home at age 94, held a variety of titles throughout his life, including decorated war hero, successful businessman, congressman, ambassador, CIA director, vice president, and president. But many knew him as much more. “Poppy” was a nickname bestowed by his mother because his namesake and maternal grandfather was already known as “Pops.” “Have-Half” was the result of his frequent kindness in giving away half his sandwich to others. Bush was the last U.S. president so far to serve in combat during wartime, the last U.S. president to serve in World War II, and also the second-youngest man to enlist in the Navy as a fighter pilot during that conflict—on his 18th birthday in 1942, the day he graduated from high school. For a 40-year period, every president from Dwight Eisenhower to Bush served in World War II. Bush was also the last of eight presidents to be a member of Veterans of Foreign Wars. Bush’s beloved wife, Barbara Pierce Bush, died April 17 at age 92. The couple had celebrated their 73rd wedding anniversary Jan. 6, making the pair the longest-married presidential couple in history. The two married in 1945 and had six children, 17 grandchildren, and eight great-grandchildren. His former White House photographer told ABC News that Bush was still heartbroken over her death, in the wake of which he was hospitalized twice. As a newly minted naval aviator, Bush’s plane was shot down during a bombing run over Chichi Jima, a Pacific Ocean island 500 miles from mainland Japan. The future president was forced to jump out of the aircraft as it hurled toward the ocean. Eight of his comrades were captured, tortured, and killed by the Japanese. Bush was the only one to survive. He gave his service revolver to a Navy lieutenant aboard the submarine that rescued him drifting in a life raft. Bush served a total of 58 combat missions while in the Navy. In 2007, NBC News reported that the fellow war veteran returned the .38-caliber Smith & Wesson service revolver to the former president. Bush then donated the firearm to the National Constitution Center in Philadelphia. To the concern of his wife and family, Bush celebrated birthday milestones by skydiving, a wartime promise he made to himself. 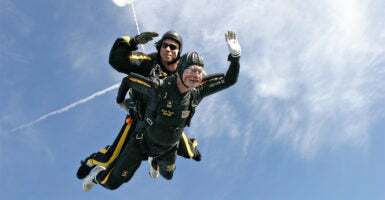 The former commander in chief went skydiving on his 75th, 80th, 85th, and 90th birthdays. Bush became “the longest-living president in U.S. history” in November, surpassing Gerald Ford, who lived to be 93 years and 165 days old. Born on June 12, 1924, in Milton, Massachusetts, Bush was older than Jimmy Carter, the current second-longest-living president. Bush played in the first-ever College Baseball World Series in 1947, serving as first baseman and captain for the Yale Bulldogs. He played 76 games at Yale with a batting average of 0.224, including one home run. Bush kept his first-base glove from college in a drawer in the Oval Office as president, and later used that same glove to throw the ceremonial first pitch on Major League Baseball’s opening day on April 3, 1989. Besides playing golf and making waves in his speedboat, Bush loved to throw horseshoes. The president was a member of the National Horseshoe Pitchers Association and loved the game so much that he installed courts at the White House and Camp David. His affinity for the sport was so well-known that Queen Elizabeth II and Prince Philip gave the president a a silver-plated horseshoe set on their 1991 visit to the U.S.
Bush’s eye-catching socks became famous in his post-presidency, inspiring a line of merchandise sold by the Republican National Committee. During the former president’s journey to his final resting place, including the funeral service Wednesday at Washington National Cathedral, he will wear a novel pair of socks paying homage to his nascent years of public service as a naval aviator.